Three travelers share a meal together in “Jesus Appears at Emmaus” from “The Passion of Christ: A Gay Vision,” a series of 24 paintings by Douglas Blanchard. 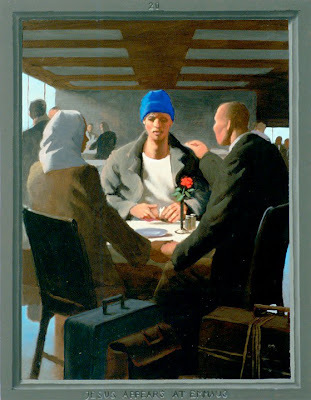 Three travelers share a meal together in “Jesus Appears at Emmaus.” Jesus is hard to recognize with his hair hidden under a bright blue ski cap. He sits at a restaurant table, breaking a loaf of bread. His companions, a man and a woman, touch in an attitude of prayer. The setting looks like a contemporary airport lounge with large windows. The table is nicely set with a red rose and generic salt and pepper shakers. Suitcases in the foreground confirm that they are traveling. It is a normal scene of friends eating together, until the viewer recognizes Jesus. And that is the point. The painting illustrates the Biblical story of two disciples who met the risen Christ on the road, but didn’t recognize him at first. A disciple named Cleopas and his unnamed companion encountered the stranger on the way to Emmaus, a village seven miles from Jerusalem. They confided in him about their sadness over Jesus’ crucifixion and the disappearance of his corpse. The mysterious stranger listened and comforted them by using scripture to explain what happened. Impressed, the disciples persuaded him to join them for supper in Emmaus. When the stranger blessed and broke the bread, they connected completely. Suddenly they recognized Jesus. The Emmaus story fits the mythic pattern of the magical traveling companion who appears unexpectedly and offers help. Such legends were common in medieval Europe when the practice of pilgrimage was important and widespread. Artists have been depicting Emmaus since the fifth century, but in the Middle Ages they gave more attention to the scene of encounter on the road. Jesus wore a large pilgrim’s hat to explain why his disciples failed to identify him. Pilgrimage fell out of favor in the 16th century with the Reformation. The supper scene, with all its Eucharistic implications, became increasingly prevalent. Artists began to focus on the dramatic moment of recognition, with famous versions painted by Rembrandt in the Netherlands and Caravaggio in Italy. In modern times the supper at Emmaus lost much of its appeal to artists. The mood and style of Blanchard’s Emmaus are reminiscent of 20th-century American painter Edward Hopper. Like Hopper, Blanchard finds the poetry in an anonymous urban environment, capturing the elusive interaction of people in a quiet moment just before something happens. Artists of the past generally assumed that both disciples at Emmaus were male, but Blanchard brings the episode into the present and makes one disciple female, subtly communicating that gender does not limit a person’s relationship with God. The woman wears a headscarf, perhaps a hijab. Jesus may be sharing a meal with Muslim refugees. That possibility is especially powerful because Blanchard painted his Passion series in the aftermath of 9/11 attacks by Islamic terrorists. He strategically places the red rose so it blooms over Jesus’ heart, echoing the Sacred Heart motif in which Jesus exposes his physical heart as a symbol of his love and sacrifice. The Emmaus story has parallels with the queer spiritual journey. The disciples discovered Jesus after they left their faith community in Jerusalem. Most of the others were hiding there in fear, refusing to believe in the resurrection. The disciples on the road from Jerusalem to Emmaus are like LGBT people who turn their backs on their churches of origin -- and then find God on the outside! In the Bible narrative Jesus disappears as soon as he is recognized. The disciples return immediately to Jerusalem to tell the other disciples what happened. 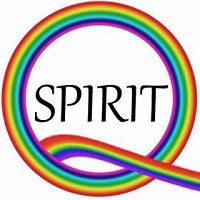 Likewise, some LGBT Christians feel called to return to religious institutions to proclaim their fresh understanding of the all-inclusive Christ. I think the 2 were a couple who lived in Emmaus. They were returning home. It is said that it is a garrison town for the Roman army. Arab Christian women wear a head scarf too. Here is another image I like. Thanks for your thoughts, Ann and Trudie. I also have the impression that Cleopas and his companion were returning home, but I don’t see that specified in the actual gospel text. Ann, I like the painting in your link by Filipino artist Emmanuel Garibay. Another Emmaus supper by that artist graces the cover of Seeking the Risen Christa by Nicola Slee. She is the one who introduced me to Garibay’s art, with its female Christ figures and lively, communal expression of spirituality. Trudie, I’m glad you reminded me about Chi Rho Press. Their “Road to Emmaus” book laid the foundation for my understanding of the Emmaus story… and it’s still in print at Chi Rho Press . But could they not have been a gay couple? Perhaps Jesus was reaching out to the lost, the ignored, the oppressed once again--just as the risen Christ appeared first to the women and commissioned them to tell the good news. Perhaps this is another example of Jesus upending the status quo.